The preparation of the traditional miso soup cannot be done without a “dashi” broth, which helps bring out the delicate flavors of many Japanese dishes. 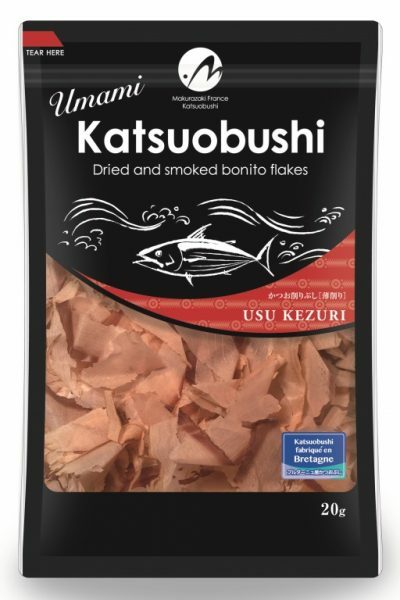 Yoromiso is honoured to offer for your dashi, a quality Katsuobushi in partnership with “Makurazaki France Katsuobushi”, established in Brittany since 2016. Katsuobushi is a dried, smoked and matured or fermented fish that is made with striped bonito (also known as “skipjack tuna” or skipjack). It is used to make the traditional “dashi” broth, a genuine base of Japanese cuisine that complements many preparations by offering the “umami” flavor. Its name comes from Katsuo (“Bonito”) and Fushi (“filet”). Famous for its nutritional values, Katsuobushi contains 9 essential amino acids and is rich in protein (72% dry weight), iron, vitamins D, E, B2, B3, B6, B12, DHA and EPA and inosinic acid, which promotes cell metabolism. The aroma of Katsuobushi does not come from a single substance but from a complex combination of different elements. Indeed, and like miso, it contains many aromatic components that enhance and make all kinds of culinary preparations more appetizing. There are several types of Katsuobushi: Arabushi (90% of production in Japan), Karei-Bushi and Honkarei-Bushi. These differences are due to the work done after the smoking stage. In fact, Karei-bushi (-3 cycles) and Honkarei-bushi (3 cycles and +) undergo several fermentation cycles + sun-drying with a aspergillus-type ferment, whereas Arabushi is only matured after smoking. Yoromiso offers you a variety of “Arabushi” type Katsuobushi, the other varieties being for specific Japanese dishes. How do they make the Katsuobushi at “Makurazaki France Katsuobushi”? To produce their katsuobushi, it takes between 6 and 10 weeks depending on the size of the Bonito that is used. This work is artisanal and respects a true know-how of more than three centuries developed in Makurazaki in Japan. The Bonito are pre-filleted in 4 loins with knives to be then cooked in water at above 95 °c. This operation guarantees the preservation of the nutrients and flavours of the bonito. After this “Shajiku” cooking, the loins are peeled and de-bonned with pliers to be then smoked and dried for several days with selected wood (the composition of which is kept secret *). The loins are then matured for several weeks to concentrate the aromas and nutrients. At the end of the manufacturing process, the katsuobushi becomes very hard and it is necessary to cut it in fine shreds in order to use it. It is thus traditionally shredded among individuals and chefs with a wooden planer close to the mandoline slicer named Kezuri-ki. “Makurazaki France Katsuobushi” uses more productive and mechanized equipment that shreds the loins into flakes helping to highlight the subtle flavors of the Katsuobushi it manufactures. * Smoking wood is a rigorously selected and controlled hardwood mix to complying with pesticide, Dioxyne and heavy metal standards. Who is Makurazaki France Katsuobushi? Makurazaki is a town on the island of Kyushu in southern Japan where Katsuobushi (with a protected designation of origin) has been manufactured in the same way for over 310 years. Comprised of over 50 artisanal factories, it is the largest producer of Katsuobushi in Japan. “Makurazaki France Katsuobushi” is a grouping of 10 Japanese partners from Makurazaki and its surroundings (9 artisans and 1 cooperative), who, concerned about the lack of flavor in the dashi in Europe and facing the difficulties of exporting from Japan, have settled in Brittany in order to offer you a quality Katsuobushi, made according to the Japanese tradition. What is the origin of the bonito of “Makurazaki France Katsuobushi”? The bonito are fished from spring and purchased from fishermen based in Brittany who are responsible for a respectful and accountable fishery in the FAO51 zone in the Indian Ocean. Seiners (Seine vessels) flying the French flag are certified as “Friend of the Sea” and “Dolphin Safe”, and are checked on numerous occasions from the Seine to the auction. “Makurazaki France Katsuobushi” verifies this fishing quality and practices biological and chemical analysis of the bonito throughout the Katsuobushi manufacturing process. What are the uses of Katsuobushi? -For the preparation of the traditional “dashi” broth, which is used for the daily preparation of miso soup on the other hand. It can also be used for cooking broth of rice, vegetables, fish, shellfish or meat, or in sauce with miso on grilled eggplants. It can also be used for udon, ramen, Nabe and Oden (Japanese pot-au-feu). After using the Katsuobushi for broth, the shavings will serve you to prepare the delicious furikake that accompanies the rice beautifully.